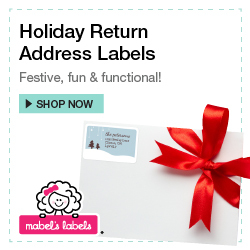 Stocking Stuffer Combos and Holiday Return Address Labels Now on Mabel’s Labels! From now until 12/31, Mabel’s Labels is offering their limited edition Stocking Stuffer Combos and Holiday Return Address Labels! The Stocking Stuffer Combos make the perfect stocking stuffer, party favor, and personalized add-on to other gifts. Best of all, you only pay $30 for 6 sets! The Holiday Return Address Labels are adorable and come in a variety of exclusive limited-edition Holiday designs. Don’t miss your chance to shop these great offers!